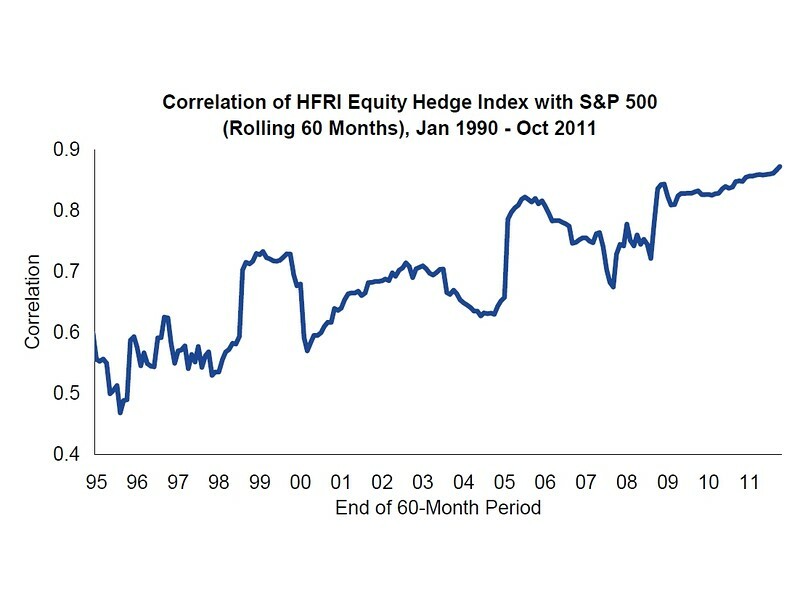 The liquid-alt pitch is that individuals can access the same types of investments as university endowments and other big institutions, to diversify equity-heavy portfolios, typically with a 10% to 20% allocation to liquid alts… The advantage of the [AQR Managed Futures] strategy […] is that it is uncorrelated with other asset classes, and “has the most consistently strong performance in equity bear markets.” That is when diversification matters most, as was the case in the third quarter of last year and the early part of this year. Ideally, returns of a liquid-alt fund should not only be uncorrelated with those of both stocks and bonds but also significantly positive over a long evaluation period. Let’s take a look at the performance of three AQR funds with a sufficiently long history. Please note that AQMIX had the first full month of returns in February 2010. Consequently, the first rolling 36-month return became available at the end of January 2013. As could be expected, the fund had lower correlation to stocks than to fixed income, although both coefficients were quite low (generally, correlation below 0.6 provides diversification benefits). Compared to AQMIX, this strategy had a higher correlation to bonds. In contrast to AQMIX and ASAIX, this strategy had a higher correlation to equities than bonds; however, both coefficients were still pretty low. AQR’s approach can be hard to understand. Because of this—and to deter hot money—the firm sells its liquid-alt funds almost entirely through financial advisors. Retail buyers can access the funds directly through fund supermarkets like Fidelity, but direct investments involve a minimum of $1 million. Investments through advisors and 401(k) plans have no minimum. The major positions in the reference portfolio were the PowerShares DB US Dollar Index Bullish Fund (UUP; fixed weight of 38.1%), iShares 20+ Year Treasury Bond ETF (TLT; 22.9%), iShares MSCI Netherlands ETF (EWN; 9.3%), Guggenheim CurrencyShares® Swiss Franc Trust (FXF; 6.0%), Consumer Staples Select Sector SPDR® Fund (XLP; 5.5%), and Utilities Select Sector SPDR® Fund (XLU; 4.7%). The Other component in the chart collectively represents addition five ETFs with smaller fixed weights. The return correlation of the reference ETF portfolio over the entire evaluation period was 0.16 with VTI and 0.58 with BND. Given that these figures for AQMIX were approximately -0.07 and 0.21, respectively, the reference portfolio was not as good a diversifier for stocks and bonds as the fund was. However, the reference portfolio only had long positions in non-leveraged ETFs. It also returned about 8% more than the fund on a cumulative basis and with a 59% lower volatility. Similar analyses can be conducted for ASAIX and ADAIX. In the end, it is up to the investor to weigh the pros and cons of using reference ETF portfolios as substitutes for these funds in the context of the overall portfolio. We hope that our Investment Toolkit™ will provide useful services for investors who want to construct well-diversified portfolios. If you would like to use it, please register on our website. Today’s post on Yahoo Finance discusses an “all weather” portfolio recommended by one of the most famous hedge fund managers. The portfolio strives to achieve an equal distribution of risk across macro periods of inflation, deflation, high and low economic growth. The portfolio has a large fixed-income component relative to equities to get close to a risk parity (yet, it does not use bond derivatives). The portfolio should be rebalanced at least annually. These ETFs were selected to have the earliest possible inception dates and lowest sponsor fees (expense ratios). The time span of the analysis is limited by the inception date of DBC. An alternative commodity ETF, the iShares S&P GSCI Commodity-Indexed Trust (GSG), became available about five months after DBC, therefore the latter was chosen. Since about 8% of DBC tracks gold, the weight of IAU is lower than that of DBC by one percentage point (due to the limitation of setting widgets, the app only accepts whole percentage weights). Annual rebalancing yielded no further improvement in the annualized return or Sharpe ratio, but reduced the maximum drawdown to 12.1% and lowered the beta to 0.20. Compared to the traditional balanced portfolio, the all weather portfolio had all the desirable characteristics: a higher annualized return and Sharpe ratio, coupled with a significantly lower beta and maximum drawdown. However, the above analysis covered a prolonged period of decreasing and historically low interest rates that drove the returns of intermediate- and long-term bonds, the dominant positions in the portfolio. In an environment of rising interest rates (generally expected to begin next year) and falling commodity prices (already taking place), a risk-parity oriented portfolio, even with no bond leverage, may suffer.